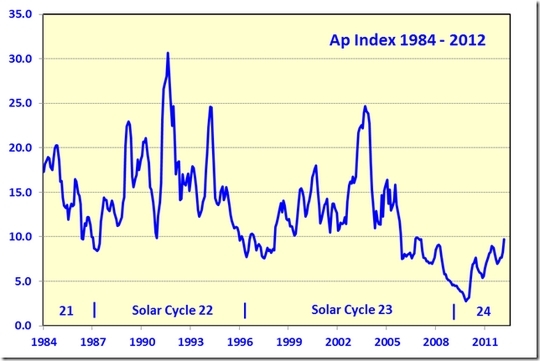 Three years into Solar Cycle 24, the Ap Index has now risen to the level of previous minima. 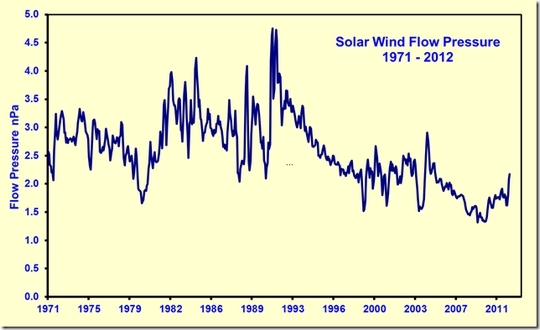 Figure 3 shows that solar wind flow pressure has returned to levels prevailing over most of Solar Cycle 23. The last time the planet had a discernible cooling period was in the 1970s, associated with Solar Cycle 20. This figure was developed to compare the Ap index and neutron count of Solar Cycle 24 with Solar Cycle 20. 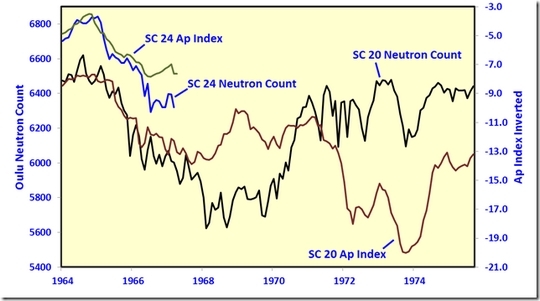 In Solar Cycle 20, the Ap index diverged a long way from the neutron count. Similar to the Ap Index, the Interplanetary Magnetic Field is now up to the levels of previous solar minima. 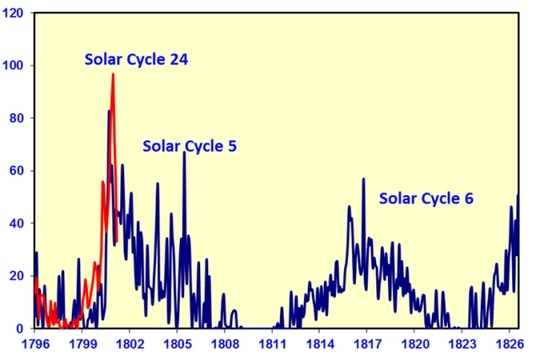 This chart compares the development of Solar Cycle 24 with the last de Vries cycle event – the Dalton Minimum. The Solar Cycle 24 ramp up in terms of sunspot number is tracking much the same as that of Solar Cycle 5 but about a year ahead of it. 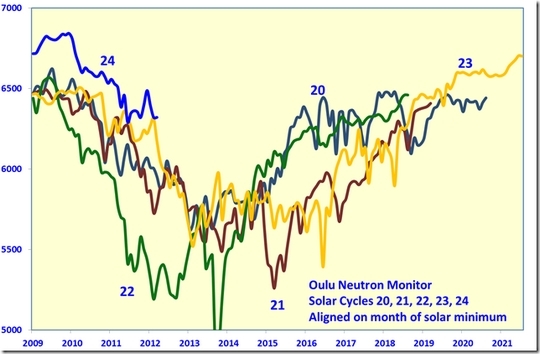 In this figure, the neutron count of the last five solar cycles is aligned on month of minimum. 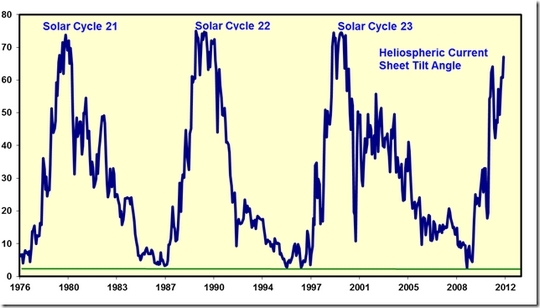 It shows that Solar Cycle 24 hasn’t departed much from where Solar Cycle 23 was at the same time. On the other hand, the neutron count could go sideways from here. 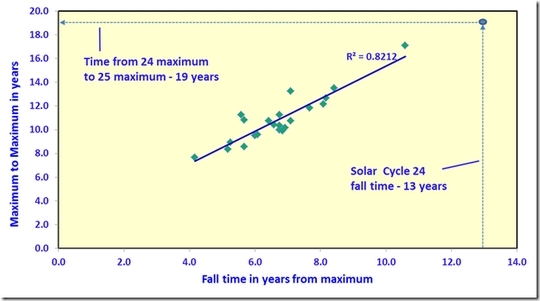 It is estimated that Solar Cycle 24 maximum will be centred on May 2013 and using Altrock’s green corona emissions diagram, we can derive the year of the 24/25 minimum as 2026. This means that the fall time for Solar Cycle 24 will be 13 years. 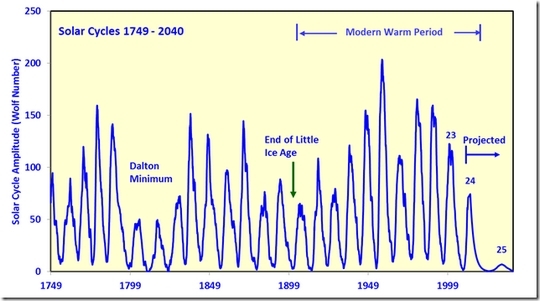 For all the numbered solar cycles, plotting fall time from the maximum against the maximum to maximum time enables us to make an estimate of the year of Solar Cycle 25 maximum. From Figure 8, the Solar Cycle 25 maximum will be 19 years after the Solar Cycle 24 maximum in 2013, which makes it 2032. The large decline in the sunspot number and F 10.7 flux at the beginning of the year, prior to the recent major flare, suggests that Solar Cycle 24 will look like Solar Cycle 5 in having a low base of activity with periodic spikes. The estimate of 7 for the peak of Solar Cycle 25 is from Livingston and Penn.